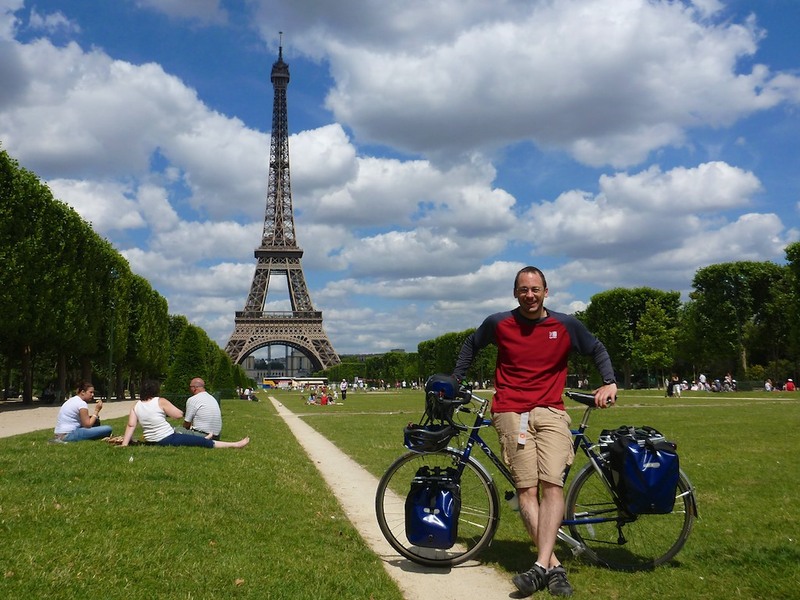 Before we get too far into this thing I have a confession to make: I didn’t cycle all the way from London to Paris. Because of limited time and an even more limited ferry timetable I started the ride from Newhaven railway station, and finished it at a friend’s house in Chambly, just north of the French capital. Blame LD Lines, whose ferry service between Newhaven and Dieppe sails twice daily and takes four hours; to catch the 10:00 boat I’d have to leave at about two in the morning, whereas the 23:00 crossing would see me in France at 03:00. Neither of those options appealed very much, so I bundled the bike onto the morning train out of Clapham Junction and made it to the port around 09:00 with plenty of time to check in. Why Newhaven? Because if you were to draw a straight line between home and my destination, Haras de Chambly’s annual summer party, that line more or less leaves England at Newhaven and enters France at Dieppe, cutting out a good chunk of northern France and with it some serious mileage. It gets better. 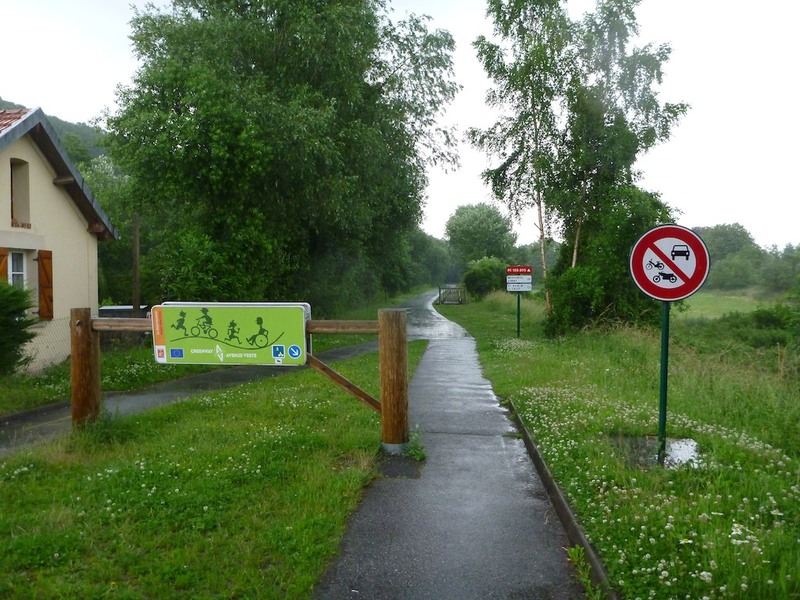 Not only are the French much more favourably disposed towards cyclists than us Brits, they’ve kindly ripped up half an old railway line between Dieppe and Paris, laid down tarmac, and put up barriers to stop motorists using what is one of the best cycle lanes I’ve come across. But I’m getting ahead of myself. 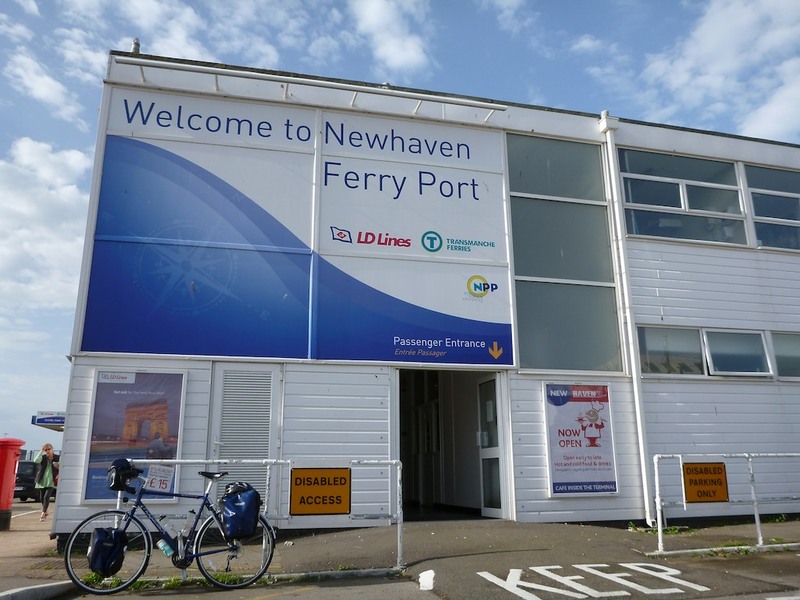 Sailing from Newhaven is a bit like sailing from Dover used to be many years ago, a novelty magnified by the fact that I’m pedalling rather than driving. When you arrive you park in a line by the check-in booth, which doesn’t open until 40 minutes before departure. Parents leave their vehicles and wander into the lounge for a coffee while kids play between the cars. Cyclists and pedestrians get priority and skip to the start of the line. I’m there chatting to two retired French ladies whose bikes have baskets on the front – they do this crossing quite frequently, popping over to England for a weekend with their bikes. Behind us are half a dozen lycra-clad guys on sports bikes and hybrids. They’re wearing matching jerseys and are enthusiastically passing around energy gels and Gatorade as we watch with a mixture of amusement and awe. After a while a French official comes over and removes the well-worn padlock from the gate behind the customs hut before checking our passports and waving us through. We ride up the ramp and dump the bikes in a corner where another, slightly oilier official ‘secures’ them with some string. I’ve had plenty of time at the port to change into something comfortable and organise myself so that I can leave the panniers on the bike and just take up my handlebar bag, but the try-athletes take up all their luggage, leaving nothing on the bikes. The four hour crossing is comfortable and begins with beers in the bar – a smug luxury over the car and lorry drivers also sprawled on the slightly threadbare chairs. I’ve gone for the cheapest possible option, and with just a reclining chair instead of a cabin my crossing is just £26 return. That’s less than my train ticket to Newhaven. I’m on my third pint and contemplating a bit of a lie-down when I notice the olympic cycling team at the other end of the bar. They’re still wearing their matching jerseys, and taking it in turns to lie on the floor and give each other leg-pulls and massages. Oh dear. There’s always someone who takes it a bit too seriously. I’m wakened from my slumber not by a snoring Welshman (thanks, ear plugs!) but by the bell indicating our arrival at Dieppe. This time around cyclists are the last in line and we have to wait until all the cars have left the boat before we can shove off. I take a while to stow my comfortable clothes and get back into cycling gear, so by the time I’ve finished faffing the other bikes have already negotiated the ramp and are making their way sheepishly through the lines of traffic queuing at immigration. I follow suit and latch on to the group of lycra boys as they hand over their passports, feeling slightly delinquent at having just blatantly jumped a very long line of cars. The guilt is lessened considerably by the columns of black cloud building on the horizon, and for the first time since leaving home that morning I’m starting to wonder if this was really such a good idea. Finding the start of the Avenue Verte at Dieppe isn’t all that easy, and never having cycled in France before isn’t helping. I feel as though I’ve still got my stabilisers on as I gingerly pick my way through town, carrying everything I’ll need for the next 10 days in my panniers and with nothing to power me onwards but my own two legs. It’s a wonderful feeling, but doesn’t help me locate the start of the cycle path that will take me to Forges les Eaux. In truth I’d already found the route some days earlier, plotting the entire track on Google Earth before transferring it to my GPS, but satellite imagery isn’t very helpful in small French towns and the best I could do was to follow the main road east before spotting one of the signs: Paris par Avenue Verte. The air was hot and had that elastic tang which signals impending rain, and before long even the generous tailwind wasn’t enough to help me escape the thunderstorm that was gaining on me like something out of Scooby Doo. I pulled over and slipped into my waterproofs just as the heavens opened. Once it’s started to rain and you’re wearing all you can against the elements you become more relaxed. Until that point you’re worried whether or not you’ll be able to outrun the storm, or whether you’ll get your gear on before being soaked. All that’s done now, and I’m pedalling alone in a biblical downpour, taking in the wonder of the Avenue Verte for the first time since joining it a few miles back. And it really is wonderful: smooth tarmac all the way, with only occasional slowing for the roads which cross the route, enjoying after many years the reversed priorities over the gone but not forgotten railway. Here and there remnants remain, the occasional redundant track signal and a few rural station buildings now converted to residential use, but on the whole the only express charging down these rails is me, smiling at the countryside through rainclouds which eventually give way to reluctant sunshine. I roll into Forges les Eaux after a couple of squelchy hours, and check into a small hotel right on the town square. The Turkish owners are super friendly and let me bring the bike into the courtyard before showing me my room, a small affair overlooking the fountain in the square below. The restaurant serves a very welcome asiette mixte, and I’m on my second or third cold beer when I notice a familiar sight on the road outside; it’s the lycra gang from the boat, finally rolling into town. I’m keen to learn what’s taken them so long, after all I’ve had a shower and a meal and they’ve only just turned up, so I go outside to get the low-down, and end up eating some serious humble pie. Turns out the reason they were doing leg stretches and reciprocal massages on the boat is because they rode down from London that morning, having completed 70 miles already by the time I’d stepped off the train at the port. I’m totally gobsmacked – they must have left around midnight – and offer to buy them a round of beers, but the leader casually plays the group’s trump card: they can’t stop long, because they’re expected in Paris later that night, having decided to ride from St. Paul’s to Notre Dame in under 24 hours. Big respect. After a good night’s rest I’m up early and keen to start the second part of the ride, 65 miles from Forges to Chambly. It’s no huge distance, in fact I used to do the equivalent every Sunday and still manage 15 miles each day to college, but that feels like an awfully long time ago now, and the loaded panniers aren’t helping. What does help is to think about it as though it’s the only thing you’ve got to do that day: get up, ride bike, go to bed. No work, no obligations, just the plan and the road. Talking of which, it really is a road now, because the luxurious cycle track comes to an end in Forges, although the derelict railway continues. I didn’t know that the Avenue Verte actually continues onwards to Paris, and having planned my route using the smallest, most direct roads I’m surprised and reassured to see an occasional yellow marker. There are also signs advising drivers to watch out for cyclists, something that seems totally superfluous given the light weight of traffic. The going is easy despite some slight hills (a sign I’ve strayed away from the former railway) and in no time at all I’m passing underneath the A16 for the first time, a sure sign that my destination is in sight. All that remains now is to find Chateau Chambly, swagger up to the bar, and enjoy some serious hospitality for a coupe of days. Cheers!